This is a cast of the brain cavity from the skull of the horned dinosaur Triceratops horridus. Analyzing the functions of a dinosaur's brain involves a fair amount of guesswork. 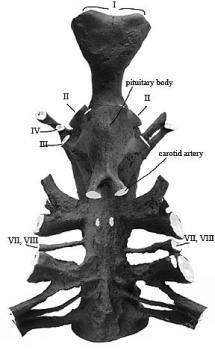 However, its form and parts can be described by using an endocast (replica of the brain). An endocast is easily made by filling the cleaned-out braincase (space occupied by the brain during life) with liquid rubber to make a mold of its internal contours. When hardened, the rubber will closely match the shape of the brain and its nerves. Right lateral (side) view of endocast, with the olfactory nerve protruding at the right and the pituitary at the bottom. The exact size of the brain itself was slightly smaller than the cavity (brain case) which it occupied in life. The endocast however, tells us much. It shows the location of all 12 cranial nerves and structures such as the pituitary body on the lower side (below the cerebellum and cerebrum) of the brain. Note the carotid arteries projecting from the rear of the pituitary. The olfactory nerve (I) for odor detection is divided at the tip of the forebrain. The large optic nerve (II) with a sensory function for sight is located above the base of the pituitary body. Nerves III and IV were also associated with vision by controlling movement of the eyeball and eyelid. Nerves VII and VIII near the back of the brain (medulla) are also sensory and relate to hearing and equilibrium. Other nerves function as sensory or motor control for various feelings and movements. Chair of Paleontology Bruce Erickson showing the relative location and size of the brain.